Web Design, Teaching, Mac Repair, etc. 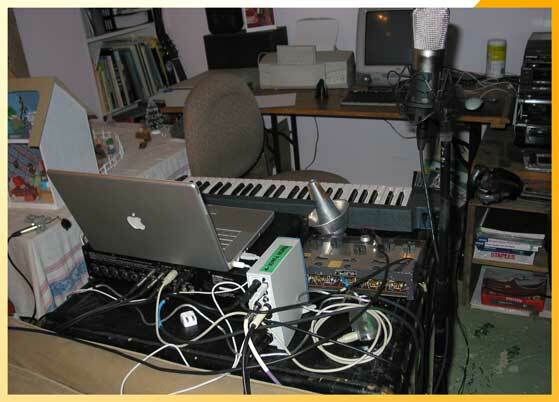 5/25/04 - Well the performance (called "Henry's Beard", strangely after my sister's hilariously obese cat) went great. People liked our cube part, and I liked it too. Demetrius and I needed to do a better sound check, but we were a bit rushed. Very fun. And loud. You can see images of the performance too. No sounds yet, hopefully that will come soon. Curtis absconded to China with the video footage and will be back sometime in June. Of course the Percussicube was finished for the concert. I just didn't have time to update the site. If anyone wants any info on how to build a similar instrument, email me, I'd be more than glad to help. Later. 5/9/04 - Added various sample based sound generation thingies. Attempted to make it much more dynamic and interesting to listen to and to play. Samples consist mostly of glass/plastic bottles being bounced, crushed and jumbled about in buckets (real ones, not the max object :) . Thinking about performance options for Friday. Going to have several different modes for performance through which I can switch. 4/26/04 - I found that it is really fun to play my instrument with a hammer and to rip it apart during playing and beat it with its own parts and step on it and hit it with my head and lift it up and drop it etc until it falls apart completely and that is the end of the performance. The WHO all over again! But this one goes to 127!... and can be easily put back together again. And of course the Powerbook sits a safe distance away. 4/25/04 - Made beat sensor, a way for it to repeat what I did last measure in a different form, more sound generation stuff - I'm finally starting to like some stuff I am getting, though it needs to become more diverse. Began to integrate mouse preset control. Added "Blow Up" feature where if the time-density of hits is above a certain level for the last 12 hits, volume increases, overdrive kicks, and a signal rising in pitch kicks in. Also I think I have fixed some of the issues in the averaging of hits that didn't work because I had neglected to consider the order in which Max executed the commands. A few [t b b i] objects saved the day - I think. We will soon see. 4/17/04 - Reworked data processing AGAIN. All to stuff below just did not work in the real world and made the thing way to delicate to play correctly. I have now revised the system so it averages all the velocities and coordinates of the any triggers that go off together with added weight to the two that occur first and diminished weight to those that occur last. This now determines position. I have thrown out all the other crap. In doing this, the Lobjects for Max have become my very good friends for list operations. Also I have developed a new way to sense tempo that uses [lp.stacey] to detect when I am making a continuous beat (one that has a low standard deviation of time between hits) and fire only then, instead of just using the mean of to last x hits within y amount of time which yields unwanted results when I am playing more complex rhythms. Anyway, now I can beat the thing like crazy and it sort of works! This will be a much better performance than my first ideas. Maybe I can even take it to where the thing will fall apart by the end of the performance, as the cube part is nearly indestructible and if so easy and very cheap to repair - that would be crazy. Now to make it sound cooler!! 4/14/04 - Check out new IMAGES. Reworked data processing, added system to average two adjacent triggers together (if I bang on the tube between them) to estimate where hit the tube and sent the object there. Also added control from the drum unit's sustain pedal where if it is pressed, and hit sends the object immediately to its destination, more like real percussion and possibly more responsive for playing. All of this is very complex for me, and I still don't know how it will really work. Here's hoping. Also I have reworked the sound somewhat to sound when a trigger goes off no matter what, so that quick movements (hard hits) will not go un-sonified due to the delay induced by calculating velocity and basing attack of the sound on that. 4/10/04 - I played it for the first time yesterday. It was not too great. "Anti-ergonomic" to play and the sounds it makes are not that great yet. So I must really rethink / rework stuff. But I have ideas! And by the time it is "finished", everything below may be inaccurate. Sorry - no new Info lately. Project has been on hold while I was in Rome for the week with the Brown Jazz Band. 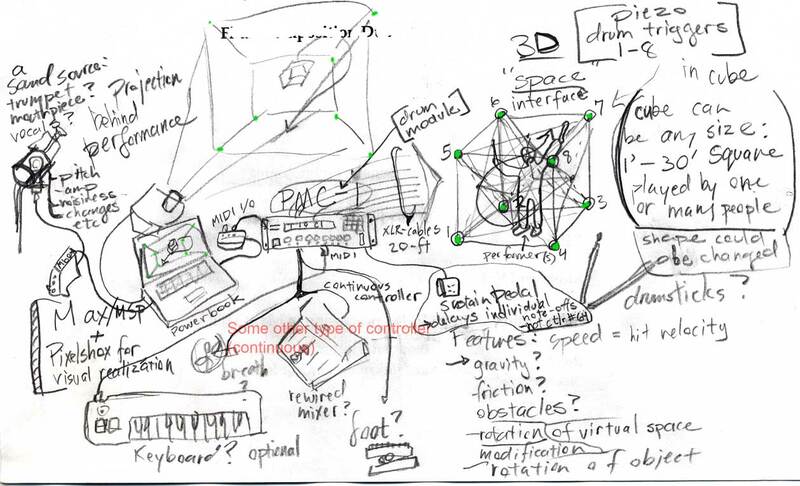 Sound will be probably be generated in two possible modes, one where hitting a trigger node will trigger sound, the other where sound will be triggered somehow depending only on the motion of the virtual object through space - based on velocity and/or acceleration. Another foot pedal will control a 'freeze' function [no Demetrius, not a "freeze the computer" function] that will stop the object where it is when one achieves a sound one wants to keep for a time. A continuous controller, maybe in the guise of a pressure sensor on one stick will control intensity/volume in some way. A memory function is also a possibility. I have a simple realtime 3D visualization that can be used by the performer and/or viewed by the audience. It is done in the free Pixelshox environment, which accepts MIDI controller data in realtime. The 'Physics' of the virtual space currently include imitation of either a frictional or accelerating force on the object, 'wobble' (oscillation in 3D, the magnitude and frequency of which can be controlled with the instrument) and a sort of pseudo-inertia (proportional to velocity) that comes into play when the object changes direction, making it continue on its previous path for a small amount of time before swinging around. The instrument can be small and single-player or up to 30 feet square and played by many people! Right now I am having problems trying to figure out how the frame that holds the triggers in space will be constructed. I would like it to be very transparent to the audience (no sides, just edges of the cube), portable, easily reconfigurable to a different size cube, and still tough enough to stand up to being hit with drumsticks. Any suggestions? PVC tubes? removable coupling for triggers so they can be easily changed, reconfigured, put on different size frame etc. Where can i find cheap XLR couplings? mounting/covering - rubber feet that I have? pattern recognition for specific actions - series of hitting. Prob. not. 'blow up point' at which number of hits within X time causes something - granular explosion, self-driving oscillator? Done. But I have not yet tried the self driving oscillator! It's a bit scary! sound when hitting - goes sounds when note off received right after note on (within X) - i.e. when PMC sustain pedal is down. (PMC must be set fast gate to do this) possibly some sampled 'bouncing object' sounds (cans, pots, pans, boxes, shoes, fruit, animals?) that can be recognizable to listeners and triggered more instantaneously. sound for movement of virtual object - Basically Implemented with FM, granulation and panning controlled by position in XYZ, volume controlled by velocity. Needs help. Got help. Still needs more. hitting two trigs at once freezes? Implemented with "two hits at once freezes" (within 10 ms - may need to be adjusted) Possibilities: (until pedal is down for a hit? ie note off is within X like above?) Or kept on by pressure - when pressure is at high or low? value it turns off, or is on only if pressure is above/below certain value? Removed. Mouse: scroll through presets with wheel - normal is presets for movement based sound, press down scroll is for percussive sound for hitting, other buttons can either be used for press-scroll to set a value (unfortunately these values have resolution of 0-10 as that is most you can scroll in one finger motion.) or for trigger/toggle of things that need not be used always when playing. mouse position will not be used. This would not be useful here. Too much. Just a source of buttons for now that are far from the computer. In progress. May also get a numeric keypad to use for controls or to take apart and put into other buttons/switches/foot pedals/digital sensors. For now, no. Visual: lighting - lights up when hit (need to figure out how to do this nicely using 3D modeling/lighting), changes colors of background and/or object on preset selection through spectrum so u can remember - "I liked sound of green, lets go back to that - it was between yellow and blue". The audience will probably not need to see this part. We shall see. More info and maybe Max/MSP and pixelshox patches coming soon. New instruments created for use in Plogue Bidule, mostly based on flexible audio, both realtime and recorded. A piece of software for basic ear training - more flexible and reinforcing of the learning process than others that are out there for free. Built in Max/MSP.See the downloads section. Yeah. I'm a musician. I make music, honest!